The all-day event kicks off at 12:00pm, going until 10:00pm. 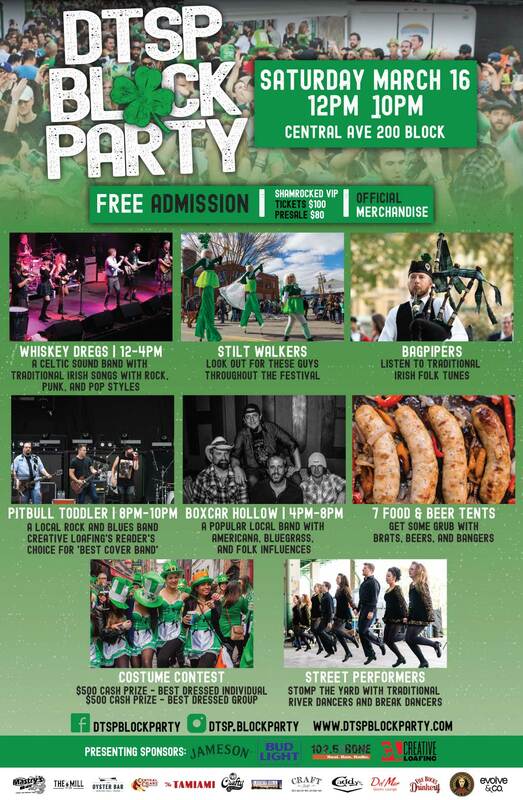 The DTSP St. Paddy’s Day Block Party will feature a full lineup of live bands, river dancers, stilt walkers, $1,000 costume contest, 7 beer and food tents, a Jameson ice luge, Jameson & Ginger flip cup games, a photo booth, official merchandise, games, and more. General admission is free to the public and VIP tickets are on sale now. 12:00pm – 4:00pm – Whiskey Dregs, a Celtic sound band with traditional Irish songs with rock, punk, and pop styles. 4:00pm – 6:00pm – Pitbull Toddler, a local rock and blues band and Creative Loafing’s Reader’s Choice for ‘Best Cover Band’. 6:00pm – 6:15pm – $1000 Costume Contest ($500 for best individual, $500 for best group). 6:15pm – 10:00pm – Boxcar Hollow, a popular local band with Americana, bluegrass, and Folk influences. The block party will also feature stilt walkers and traditional river dancing at 3:00pm and 5:00pm. At 6:00pm, the most festively dressed attendees will take the stage for their chance to win cold hard cash! Two categories include best individual costume ($500) and best group costume ($500). The event will feature four drink stations and three Irish food stations. There will be a variety of drinks including Guinness draft beer, Bud Light, Budweiser, Shock Top, Michelob Ultra, Corona, Jameson, Absolut Vodka, Altos Tequila, Bacardi Rum, Beefeater Gin, and Coca-Cola soft drinks. The food options will include Bratwursts, Fish & Chips, Bangers & Mash, Fries covered in Guinness Gravy, and even a made-to-order donut stand. VIP tickets will be available for $80 pre-sale starting late February and $100 at the door. The VIP tickets include: unlimited drink + eats package, exclusive VIP drink line, an official event t-shirt, and more. Guests can learn more and purchase tickets online at www.dtspblockparty.com. Official t-shirts will sold at the event for $25. To pre-purchase t-shirts for $20, please visit www.dtspblockparty.com. For more information about DTSP Block Party, please visit www.dtspblockparty.com. Jameson Whiskey, Great Bay Distributors, Creative Loafing, and 102.5 The Bone. 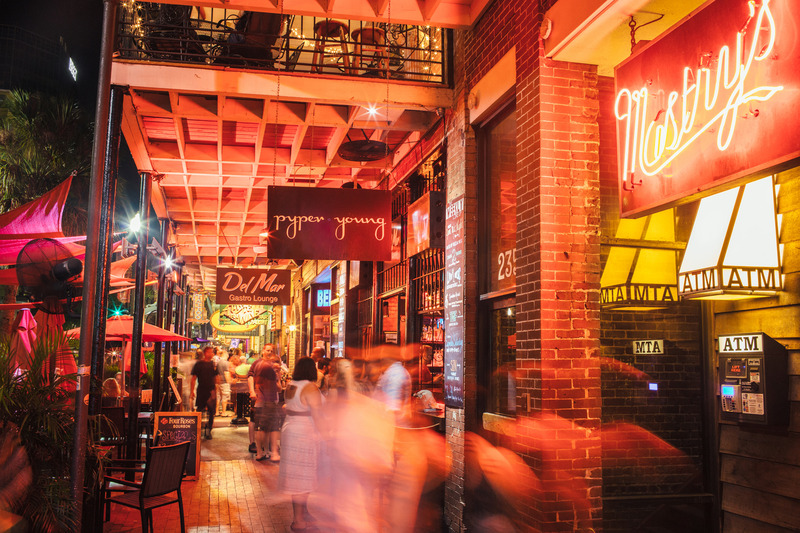 The Oyster Bar St Pete, Crafty Squirrel, The Lucky Dill, Evolve & Co, Ruby’s Elixir & Cigar Bar, Saigon Blonde, Five Bucks Drinkery, Del Mar Gastro Lounge, Mastry’s Bar & Grill, Mandarin Hide, Caddy’s On Central, Craft Kafe, The Mill, Tamiami, Movement Printing, and Justified Films. VIP Tickets are no longer available online. You may purchase them at the event.